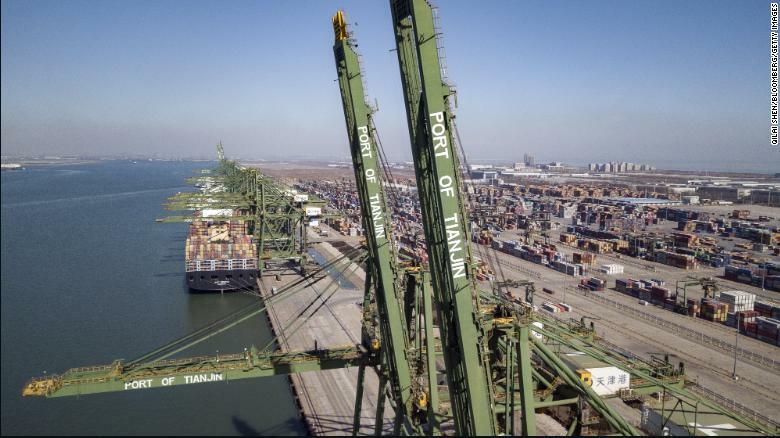 Hong Kong (CNN) – President Donald Trump has warned that US tariffs on $250 billion of Chinese exports are unlikely to go away anytime soon — even if the two countries reach a deal to end their trade war. The United States and China, the world’s two biggest economies, are trying to negotiate a resolution to their trade dispute that escalated dramatically last year with both sides imposing new tariffs on huge portions of each other’s exports. Trade talks between the two governments will resume next week after a pause in negotiations, a Trump administration official told CNN this week. US Treasury Secretary Steven Mnuchin and Trade Representative Robert Lighthizer will travel to Beijing for discussions meant to finalize an agreement between the two countries. It’s expected that a Chinese delegation, led by Vice Premier Liu He, would then go to Washington for further talks. Negotiations had been on hold as the two sides tried to figure out how to overcome disagreements about how the United States would ensure China is abiding by any deal. US concerns about how China goes about getting hold of American technology and trade secrets have also been a sticking point. The port in the Chinese city of Tianjin. China has been struggling with an economic slowdown that has been exacerbated by the trade war with the United States. The Trump administration, citing longstanding complaints from US companies, accuses China of stealing valuable commercial information though cyberattacks and forcing American businesses to hand over proprietary technology in exchange for access to Chinese markets. Beijing rejects the accusations. But at the same time, it has recently introduced measures that attempt to address the US concerns, such as a new foreign investment law that was rushed through this month. For its part, the US government last month indefinitely postponed a major increase in the tariffs on Chinese goods as the negotiations continued to progress. Trump is eager for a deal that could boost the stock market and improve his re-election chances in 2020. At the same time, the Chinese government is trying to counter an economic slowdown that has dragged the country’s annual growth to its lowest level in three decades, weighing on businesses and consumers. The Trump administration official told CNN this week that the two sides hope to reach an agreement to be signed at a summit in late April at Trump’s Mar-a-Lago resort in Florida, where he previously hosted Chinese President Xi Jinping in 2017. Trump’s rhetoric on the trade negotiations has veered between hawkish and highly optimistic. He said nearly a month ago that the two governments were “getting very, very close” to a deal for which he would participate in a “signing summit” with Xi. Reports suggested the summit could take place in late March.